Chop baby corn, capsicum and onion lengthwise. Grind chopped tomatoes to a paste and keep it aside. Heat oil in a pan or kadai and add cumin seeds. When it splutters, add sliced onion and ginger-garlic paste and saute well till the raw smell goes off. Add the tomato paste, chilli powder, coriander powder, turmeric powder, cumin powder and salt , mix well and cook for 2 minutes in low flame. Add 1/2 cup water and mix well. Then add chopped baby corn and cook till it turns soft for about 5 minutes. Add the capsicum and cook for 1-2 minutes. Do not over cook. Add tomato sauce, mix well and cook for 2-3 minutes till all the water content evaporate. 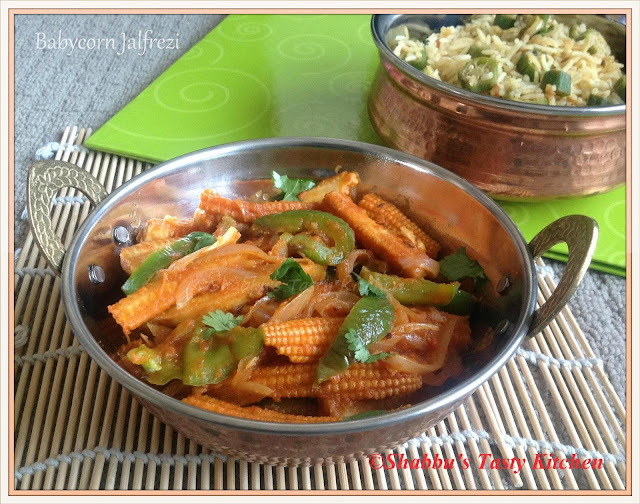 Switch off the flame and garnish with coriander leaves...Serve warm with pulao/roti..
Do not over cook the baby corn and capsicum..It should be crunchy..